It looks like the "Chinese New Year" idea might be a good one. I've had a few comments and private posts indicating that it's worth exploring, so now it's a case of determining the best way to continue with it. One of the options I'm looking at involves resurrecting ideas about the mutant animal game, perhaps with characters trying to earn the favour of twelve immortal animal spirits according to the specific traits traditionally associated with these beasts. But that involves getting the mutant animal game finished first, at least to a level where these adventires make sense. Another option would involve scenarios for FUBAR, perhaps a cycle of kung-fu adventures in a mysterious pseudo-Buddhist/Taoist/Confucian legendary realm. That game is certainly in a more ready state. I've been thinking about doing a series of monthly games, or dungeons, or something, to align with the twelve months of the Chinese Zodiac. Chinese New Year is about a week away. I've ended up at another one of those points where I've got too many ideas, and not enough time to pursue them all. This is usually the time when I start writing a bunch of half finished concepts, store the, in some kind of file than promptly forget about them. A few days ago, there was a really great post by someone who was developing a post apocalyptic setting. The idea started with a general list of items that might be found in such a setting, but then it moved to adding those tables to a list, and each time someone rolled on this list the item might be found, but it could never be found again. For a post apocalypse setting I think this is a great idea, it brings a level of scarcity to items. At first things are plentiful, then they get harder to find and maybe you have to move on to new areas once the old ones have been stripped clean. I was so inspired by the idea that I started writing up tables of my own like this, but gave it my inevitable twist. Is this what the OSR is trying to get back to? There are certain things that nostalgia chooses not to remember. Every time I play and "Old School" game, I fear that things might end up the way they did in this article. ...maybe I'm being a bit harsh. But I think it's that final comment that's the clincher here, the spirit of the rules versus the letter of the rules. Knowing that our 2 player game will last on average 32 turns, the 3 player game 24 turns, 4 player game 21 turns and 5 player game 18 turns, we need to know how quickly to open up the game for exploration potential. This applies to almost any RPG scenario, but it's often something that a lot of designers just don't think about. At the start of play I like to have a limited range of potential for exploration and character development, at this point the game is more about establishing the ouevre. Then as the game progresses we see more opportunity to explore the world in a way that makes sense with what we already know. As play comes to it's conclusion, more choices end up leading to a climax. I've been thinking about this "scroll game" concept, where the characters work their way up the scroll through exploration, but the bottom of the scroll gradually winds up to represent some threat that gradually approaches. I've just been alerted to a really interesting post delving into the origins of our hobby. Character Sheets in 1975 gives some imagery and context for the very first character sheets in RPGs. With all this OSR discussion lately, it really makes you wonder how the hobby could have evolved in different directions before these fundamentals we locked into place. Lots of conversation about the OSR today. There are the inevitable discussions about what it is, and what it isn't... and I've never seen debates like this get resolved successfully. Nebulous entities don't work like that, much like the "Powered by the Apocalypse" discussions a few weeks ago. There have been some very vocal discussions about whether the OSR actually has innovation, or if innovation exists in certain products in spite of the OSR. There have been a lot of points I agree with, about there being numerous flavours of gaming, and how you are hamstringing yourself if you choose to focus exclusively on recapturing nostalgia. There have been comments I've laughed at, such as the comment that the OSR is basically the "Scientology of gaming". I'm sure thee will be more discussion regarding this over the next few days, weeks, months, years... until the next buzzword of gaming comes along, and then everyone can start debating that one. It's been months since I've released something over on RPGNow/DrivethruRPG, I've had so many half complete projects that I just haven't been too motivated to complete, and so many other non-game related projects that I've neglected the shopfront for a while. 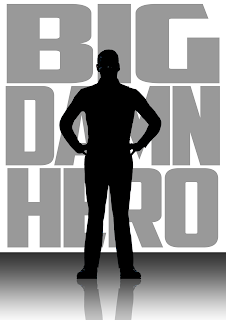 Today I released Big Damn Hero. Hopefully it's the first in a few more regular products available online. Quite some time ago, I discussed the idea of using variant techniques for displaying information in games. I even made specific mention of using scrolls as a means to present game information such as character sheets or important documentation to establish a link between the in-game narrative influencing the characters and the out-of-game mechanisms that influence the players. Recently a successful Kickstarter project, Fall of Magic, did just this. I don't think I had anything to do with it, the idea was out there...just waiting for someone to take the chance. A young local Aboriginal girl is having trouble finding a voice. She's struggling with numeracy and literacy, and is chafing at the traditional mainstream education system. She hates the rote learning, so I've been called in as a tutor by her mother and grandmother (one of the Aboriginal elders I've been working with over the past few months). What is it about groups of people that cause them to degenerate into petty squabbles once a certain critical mass group size is reached? Well actually, I should clarify that, as the group reaches a certain size petty squabbles develop, as the group reaches a slightly larger size those squabbles become full-on arguments. I say this on reflection of three social groups I'm a part of. The LARP group I've been a part of, is starting to fracture because certain members are being continually kowtowed to. The community of aboriginal elders are having major issues with the land council board members who do not respect the old ways and are simply in it for personal gain. The ferret welfare society to which I belong is also crumbling. Maybe it's just my presence causing an increase of entropy. Or maybe there is something deeper, something that can be exploited as a resource for driving tension in games. I'm determined to get a printed version of FUBAR ready before I go back to University, I'm also running a revised version of "Dead and FUBAR'd" at EttinCon at the end of the month. that means I need to start doing some layout work and it also means I need to finalise the text. The original version of FUBAR was deliberately experimental in it's page layout, and I feel the new version needs to be just as artistic, but perhaps a bit more user friendly. There are certain elements of the rules that people have indicated elusive over the years, so I'll have to make sure they are clearly explained with plenty of sidebars and play examples. Luckily that stuff is written up. The new version of the rules will probably blow out from 50 pages to 96, but that's mostly due to extra explanatory text and the inclusion of a setting. There seems to be enough interest in the new mini-game project. 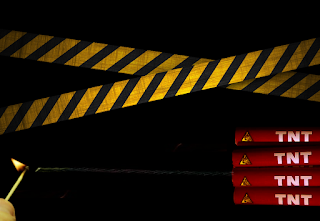 It will probably be active for a week or so, until the game gets formally released before the end of the month. I've almost finished a version of Big Damn Hero that I'm willing to let out into the wider world. It has limited layout, no pictures, probably needs some more thorough editing and proofreading, and certainly could do with some playtesting. I'll be making copies of this preliminary version available to anyone who offers expressions of interest in the project in the next day or two. Hoping for a formal release before the end of the month. 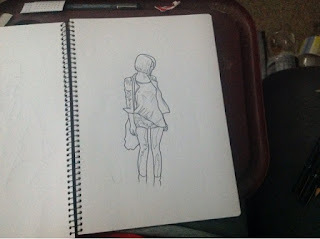 I'm drawing up some characters and some generic background landscapes. I'm not sure how they'll go together yet. I'm thinking of honing my mini game design ideas by producing a single game every month for a while. The first one will be inspired by "The Walking Dead", "Doctor Who", and pretty much anything starring Arnold Schwarzenegger, Sylvester Stallone, Vin Diesel, Bruce Willis, or Tom Cruise. It's called "Big Damn Hero". My current cartographic commission work consists of three maps, and is rapidly approaching completion. The final product should be made available for sale shortly thereafter. 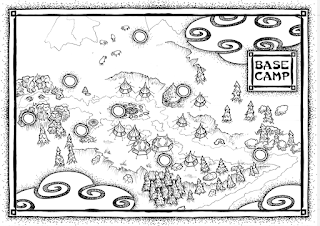 The first of the maps in the series depicts a base camp where an adventure begins. This is followed by an outdoor map depicting the glacier between the base camp and the distant mountain. Finally, a map of the mountain itself and the legendary petrified dragon which forms the dungeon labyrinth within it. Still a bit more work to go, but hopefully these near completed maps get your attention. When I GM, I like to bombard my players with options. I would rather have my players tossing up which lead to follow rather than trying to work out a single lead while the story stagnates. I run a lot of short form games, three/four/five session storylines, before we move on to something new. This gives the opportunity to try a variety of rpgs, and stops us getting bored from the slow slog through tedium that I've encountered in almost every long term campaign I've suffered. Practice at this short form campaign style has lead me to a few specific thoughts that I've decided to share. Thanks to everyone who has been reading the blog through 2015. Hopefully there will be some good reading to follow over the next 12 months as well.